Apparently I’ve become more accepting of dumb meathead action movies, or at least those with charismatic leads. This is the third John Cena movie I’ve watched (not counting Ready to Rumble of course), and this is his most JOHN CENAEST role, in my estimation. At least WWE Studios has an alright idea about how to cater to their market, though I think this film would have been more successful had it not had the WWE stigma attached to it. 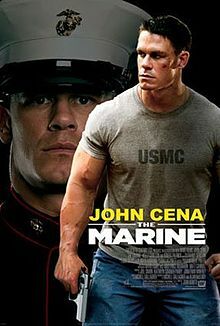 Anyways, Cena stars as the impossibly named John Triton, a recently discharged Marine going back home to his hot wife, Kate (Kelly Carlson), and struggling to find meaning in his day-to-day life while also learning to cope with Post Traumatic Stress Synd… no I made that last part up. It’s a dumb action movie with little suspense, but a whole lot of suspension of disbelief. Triton has more lives than a cat, as the film’s villain, Rome (Robert Patrick having the time of his life and looking more and more like Martin Sheen everyday), remarks. Triton escapes from far too many GIGANTIC FIREBALL EXPLOSIONS to be believed. It’s a ridiculous action movie, with an alright premise, but super cheesy. It doesn’t get away from what it is, and kind of celebrates it, which is why I’m not going lower than a 2 on this one.